At the foot of Guara’s Sierra, on the right riverside of the Alcanadre River, where vineyards alternate with wheat, barley and olive tree fields and small holm oak forests, more than one hundred years ago our grandfather Martín Palacio continued with his ancestors tradition of growing vines and making wine in the Family House in Bespén. Our father Francisco Estrada kept on farming the land and traditionally producing wine in the old subterranean cellar and it is in the year 2006 when the three young Estrada Palacio Brothers, gathering a long tradition of quality wine making, create the actual winery which emerges as a very artisanal, cared about , familiar and very personal project. The knowledge acquired for more than 30 years amid the family vineyards make José Ignacio a great connoisseur of the vines and their vital cycle. Throughout the year’s seasons the pruning, fertilizing, land working and even grape harvesting are done under his watchful eyes and expert hands in order to get the grapes from the vineyards to the cellar on their best condition. 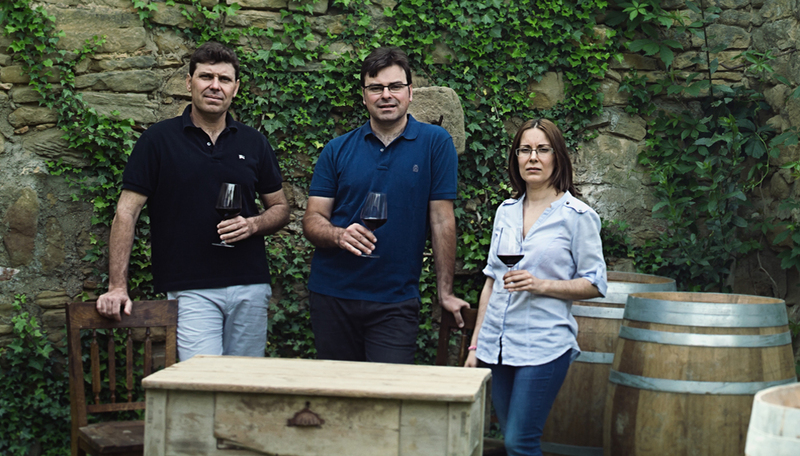 After finishing his Enology studies he travels throughout Spain’s geography making diverse types of wine in different wine regions hand in hand with prestigious winemaker Joan Milá from whom he acquires his savoir faire and learns the different techniques of quality wine making. Carlos is the maximum responsible of the winery wines, from their design to the final product inside the bottle. Ana assumes the winery management and is in charge of the projects and ideas efficient ending. The bottling, labelling and expedition of each bottle of wine are done under her supervision as well as everything referring to the administration and good working of the winery.